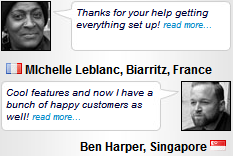 More and more people are choosing Reselleris to host their website, come and take a look why! "Good advice, great products and services, you hit the bullseye here guys! Keep it going." Reselleris servers are built using latest hardware with Intel Processors, each server is connected to a high speed 10MBps connection in our Data Center. Our fully redundant, well connected network offers real 99.9% uptime. The experienced Reselleris Technicians are on-site 24x7 monitoring the servers and take immediate action to deal with any server issues before you even know about them. At Reselleris we do what we say, NO setup fees, NO hidden costs, nothing more to pay. Computers can be confusing, so we use plain English as much as possible. Our Service Level, Privacy and Acceptable Usage policies are fair and clear, Reselleris are commited to working in an ethical and honest way. Reselleris provide one plan that gives you EVERYTHING you need to create a great website, massive diskspace and bandwidth,, host UNLIMITED sites, FREE online Site Builder, easy to use cPanel control panel and much more. The experienced Reselleris team is available to support you 24 hours a day, 7 days a week by Live Chat, Email or Telephone, our professionals all have many years experience in the web hosting and server industry and work hard to achieve the maximum level of customer satisfaction. We are confident that you'll be pleased with the Reselleris performance and support, however for your peace of mind we offer a no-quibble 90 Day Money Back Guarantee on all web hosting. Our hosting solutions are trusted by more than 80,000 clients in every country in the world, Reselleris really care about offering you the best possible service. Our Intuitive email filtering system scans and checks your messages to ensure their validity, additonally you can white/black list specific senders in the control panel, even requiring senders to verify their identity before emailing you, if you'd like. Also Reselleris guarantee not to put advertising of any kind on your website, NO Banners, NO Pop-ups, 100% Ad free hosting! From just $4.57 per month. This is not 'Just for the first year' as with some hosting companies, we GUARANTEE that this price will NEVER increase.